Legendary British sports car manufacturer Lotus marked its 70th anniversary with a VIP reception at the Goodwood Festival of Speed. The Duke of Richmond and Gordon, owner of the Goodwood estate, attended the festivities, which included champagne and birthday cake. 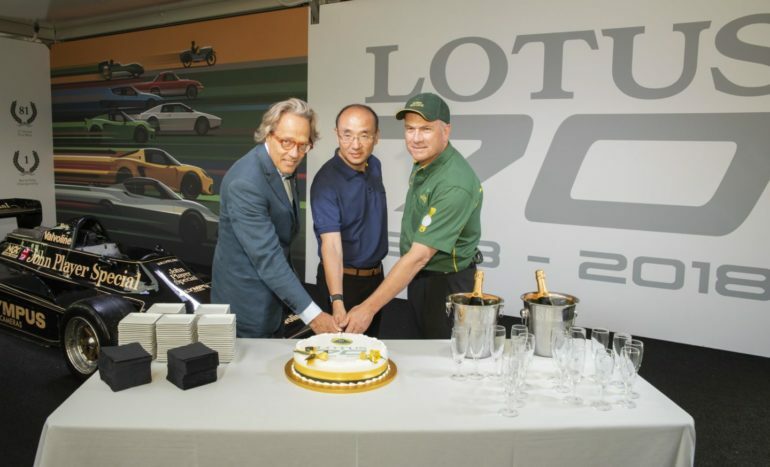 Joining His Grace was Group Lotus’ Chief Executive Officer, Mr. Feng Qingfeng, and Clive Chapman, son of Lotus founder Colin Chapman and Director of Classic Team Lotus. The festivities also featured several VIPs, the company’s latest line-up of cars, as well as racing classics from its hugely successful past. Lotus marked the anniversary as an Automotive Partner of the Goodwood Festival of Speed. The event included demonstrations from several legendary Lotus cars on the famous Goodwood hill. These included Jim Clark’s title-winning Lotus 25, Graham Hill’s championship-claiming Lotus 49, Ayrton Senna’s first F1 winner, the 97T and the revolutionary Type 56 gas turbine Indycar. Lotus also had its current line-up of sports cars on display, including the Exige Type 79 special edition, built to celebrate Mario Andretti’s World Championship 40 years ago. The event has also partnered with the Jim Clark Trust, which is raising funds for a museum dedicated to the double World Champion. Lotus’s 70th anniversary year is an important one for the marque, which was recently purchased by Chinese automotive giant Geely. The company, which has already turned around the fortunes of Volvo, has appointed Mr Qingfeng as CEO as it looks to build upon Lotus’s rich heritage. Founded by Colin Chapman in 1948, Lotus began manufacturing road cars in the 1950s and entered Formula One at the end of the decade. Since then it has won the Drivers’ World Championship six times, seven Constructors’ titles, as well as the Indianapolis 500, and become a global sports car brand.